Grammy's Attic: Are You Afraid of a Spook? I look forward to starting my Halloween cards this week....love the little ghost poking around the pumpkin. Fun!! Love that pumpkin face and your coloring on this. The DP is perfect for Halloween too. I really need to start working on some of those cards for the grands! Love your card and the BIG pumpkin. I'm the same way. I have so many cards I want to share and trying not to post too many each day. Don't even have the time to find a challenge to put them in. BUT...my goal is to enjoy making them above all else...just like you. I'm still a summer gal, but Halloween and Fall do have lovely and fun colors. Eeeeekkkk...I LOVE this card. Halloween cards are my absolute favorite and this is a beaut! So cute and that designer paper is awesome! Fabulous Halloween card!! I really like the shape you used to die cut the image! Thanks for playing along with DRS Designs! Great papers and Halloween card. Thanks for joining us at Just Us Girls. Super cute and fun card for Halloween. Love your take on the sketch. 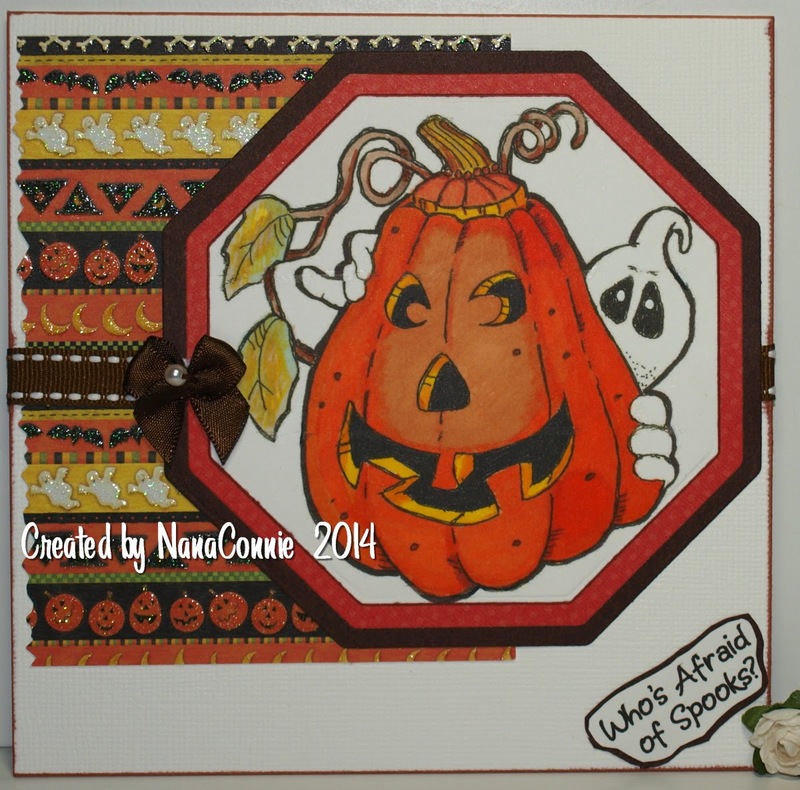 Another super fun fall inspired card - LOVE that pumpkin, NC! Darling card! Love the pumpkin and your coloring. Oh I love Autumn, but so not ready for it to arrive! Great Halloween card, great background and image. Thank you for joining us this week at HIMCR. Love the pumpkin he looks fabulous. Another gorgeous card. Nana, Your card is fabulous. I love the stitched ribbons. Great sentiment too. Thank you for joining us at Clear It Out. Such a fun card NanaC! I love that image & the paper you've used is just perfect! Lovely spooky card. Love the sentiment. It reminds me of Ghostbusters! Darling Halloween card! I love the way you colored your image & the ribbon behind him was a great idea! Thanks so much for joining in on the QKR Stampede & Eureka Stamp blog hop! I love a great Halloween card and this doesn't disappoint!! Thanks for playing along at Just Us Girls! I also love this time of year and I love your card! Great coloring on the pumpkin! 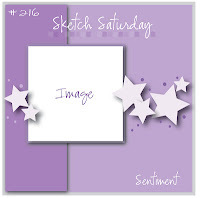 Great spooky card... love the image :-D. Thanks for joining us at Sketch Saturday! I love QKR images! I recently picked up one for Halloween and I'll have to get to that pretty soon. This is darling and fun! Such a cute tiny bow, too!